We rejoiced in the Baptism of Jensen Keast on the 17th February. Rev Andres Miranda travelled from Victoria to lead the service. His sermon was taken from Isaiah 60 on the subject of Revival and Remaking. There were also a number of family visiting for the special event, some from New Zealand and others from Canberra. We enjoyed a great fellowship lunch afterwards. Pictured with Jensen are parents Luke and Tessa. This years winter car rally (23rd) took us from Ulverstone to Turners Beach, then Devonport and Spreyton before stopping for lunch at the community park in Railton. Pictured here are the competitors doing their Pictionary test before heading off on the afternoon stage. This took us to Sheffield where we had a number of clues to find from the town and murals. Then off to a circuit of Nook and finishing at Latrobe late in the afternoon. This year's winners - Esther, Sandra, Ian, Belinda and Melody! A great course set by Niklavs, Matthew and team. 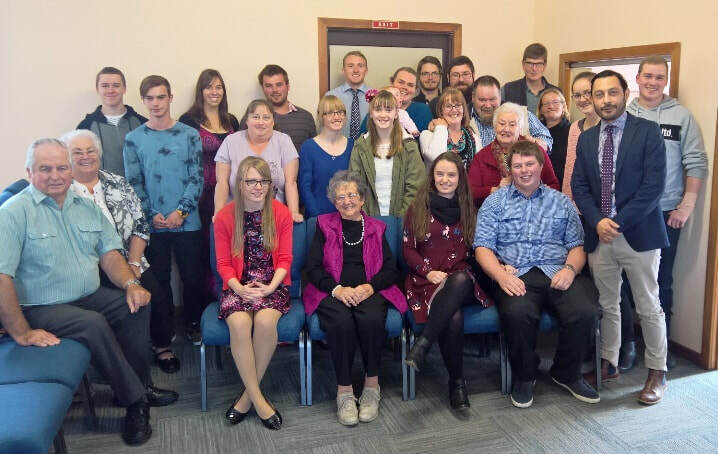 On the 20 May we were blessed in receiving three new young members into the congregation. These were Paul Keast, Tahlee Briggs and Simone Hamilton. Paul has transferred to us from Canberra CRC and Tahlee and Simone were received on profession of faith. Tahlee had the additional privilege of receiving baptism. Rev Andres Miranda took his text from John 5:1-15, emphasising the need of a committed and focussed response to the Gospel message, one evidenced by a new walk with Christ that leaves behind the old ways. Following the sermon we rejoiced in sitting together at the Lord's Supper. We enjoyed a great camp at Arm River over the weekend of 6-8 October. Highlights included a fellowship program on the Friday night of arrival, Sat morning pancake breakfast, Walk up the Walls of Jerusalem track to the trappers hut, Sat evening BBQ, activities evening, Sunday worship service and study. Devotions were presented by Josh, Ian, Shaun and Pat, with Neil leading the service and preaching from John 3:16. On the 14th May we rejoiced in receiving the memberships of Luke and Tessa Keast, who have transferred to us from the RCNZ. Luke and Tessa were the successful winners of the 2016 winter car rally and we look forward to the new course being set by them! 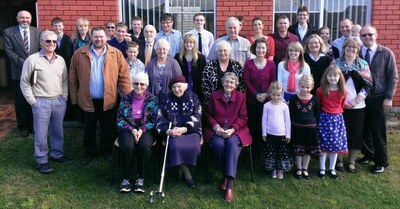 The congregation farewelled Rev Andre Scheepers on the 7th May. We gave thanks for the ministry that was provided over the last five years and passed on prayerful wishes for both he and Sue in their retirement in Qld. The congregation enters a period of vacancy as options are assessed for the future. The Presbytery have appointed Rev Andres Miranda as the Interim Moderator. Following their return from the missions awareness tour to India - Cameron, Shaun and Ian gave a presentation on the 27th January. The highlight of the tour was the visit to the PFCCI in central India. The church work there is very vibrant and diversified into church growth, Christian schooling and health work. It was a joy for the whole congregation when Shaun and Josh gave their professions of faith at the morning service on the 29 May. Pictured here is the congregation and visitors that were present for the special occasion. We had an excellent first athletes camp for the year. It took place between 11-12 March at Bakers Beach in the Narawntapu National Park. Luke led us in devotion on Friday night from Genesis 22 on the subject of Abrahams test of faith and Ben led us on Saturday morning from Matthew 18:23-35 on the parable of the unmerciful servant. There were some great group competitions and the water conditions were just right for some skiing and kayaking.